My kids love the Tashi books and last night I read the story about the Golem, which is a sort of clay giant that comes to life after Tashi – who tells some cracking stories by the way – puts a spell on it..the big clay giant lumbers around the village scaring the inhabitants, but ultimately he proves to be fairly harmless…sort of reminded me of today’s selling with the market lumbering lower throughout the session, although there was nothing really that confronting about it – there was no real panic to the sidelines after 7 straight days of gains where the index added +124pts or 2%. Volume of the selling was fairly low today and in the options market, we didn’t see any real rush on the puts (yet). 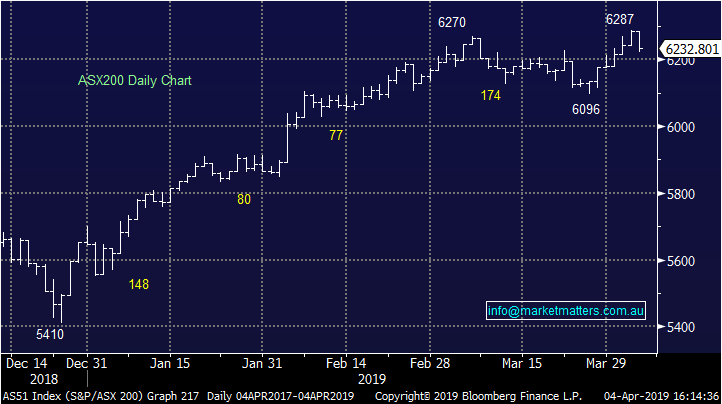 At MM we continue to target a 6000 – 6300 trading range for this quarter with the upper band tested yesterday - we are therefore now in a more sell mindset hence any buying is likely to be focused in very stock specific situations like Sims Metal (SGM) which we bought yesterday. Overall today, the market grinded lower, weighed down mostly by the Energy stocks which had failed to embrace the recent rally anyway, while there was also some selling amongst the recently hot resource names. The IT sector was interesting, normally a high beta area of the market however it remained resilient in the face of today’s selling to close unchanged on the session. Always interested to look at all-time highs on a down day and today we had a couple of market linked plays doing well. 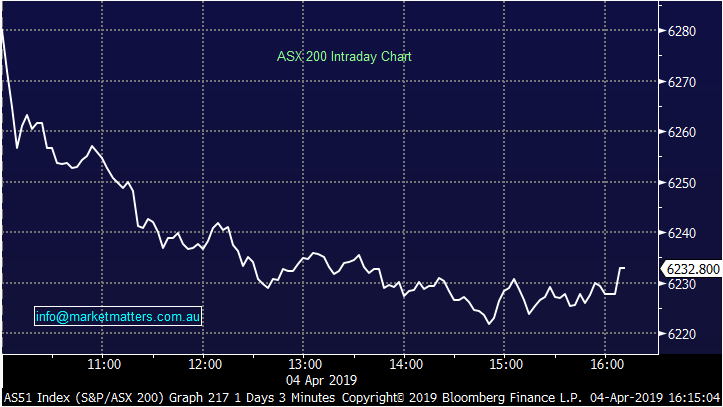 ASX limited (ASX) traded higher and is now at $71.28 – a new all-time high - while Magellan (MFG) was also bought on the back of strong inflows – around $1.17bn in March alone. Elsewhere, shorts are burning in Syrah (SYR) – the stock up another +13% today after running 8% yesterday. The recent low was 97.5c and today it closed at $1.345 on massive volume. Shorts in this stock remain around 17% or ~60m shares. Healius (HLS), the beaten up ex Primary Healthcare we recently added to the Platinum Portfolio did well, adding +4.76% to close at $2.86. As a recap, here’s our rationale for buying…. The old ‘Primary Healthcare’ runs medical centres and pathology units and the stock has had an interesting 12 months, cutting earnings guidance and falling substantially but copping a takeover bid along the way , and rallying. Healius have a very good asset base that is not generating the earnings it should. While they’re not ‘cheap’ on an estimated P/E of 18x for FY19, it’s the asset base and the earnings potential of that asset base that is important. Their largest shareholder, Chinese based Jangho lobbed a takeover offer at $3.25 per share in early January which was rejected – described as opportunistic, undervaluing the business. After the stock pulled back by ~12% Market Matters bought the stock for two reasons: 1. The belief that the bid from Chinese suitor Jangho at A$3.25 has more credibility than the market was pricing in 2. If another bid didn’t eventuate, HLS was already in a turnaround phase, cutting costs and improving earnings. While we’ve bought HLS with one eye on the takeover from its largest shareholder, the risk v reward to own the stock around current levels external to the takeover also stacked up. 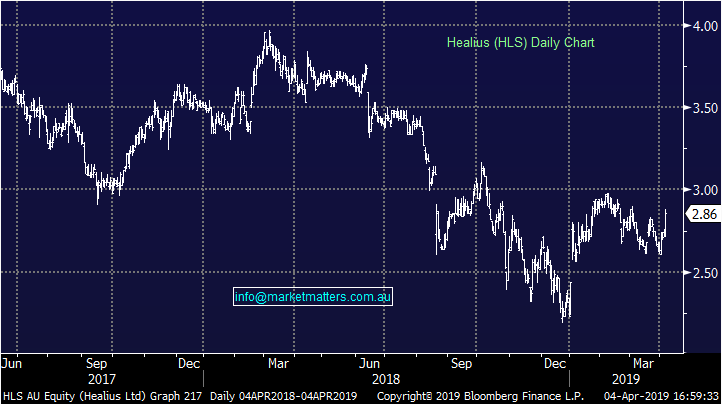 We like HLS at current levels targeting the $3.25-$3.50 area. GrainCorp (GNC), +2.15%, commenced plans to demerger the malt distribution business, MaltCo, which expected to be completed by years end. The company has been in the news lately following the takeover offer from LATP late last year, and more recently sold its liquid terminal unit last month. GNC noted it is still in talks with LATP and other parties over different parts of the business. MaltCo will process and distribute process barley throughout the world, touted as the world’s fourth largest independent supplier. 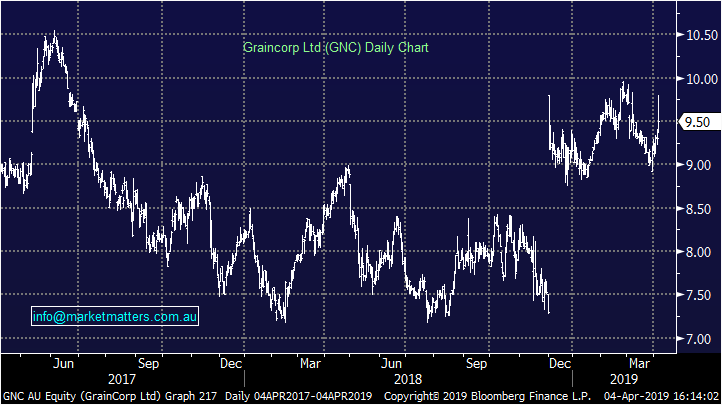 The company believes the demerger will allow GrainCorp to continue to strip costs out and simplify the business substantially. A good move in our view, and we see plenty more corporate activity in the name. 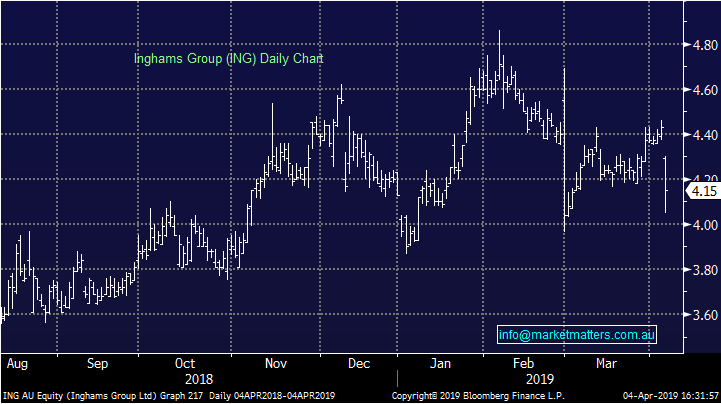 Inghams Group (ING), -6.32%, took a hit today after a large sell down from private equity firm TPG was sold pre-market this morning. Around 5% of the company’s shares changed hands at 4.28%, a 3.4% discount to yesterday’s close worth over $200m. The sale comes 12 months after TPG sold ~$200m worth at $3.62 – a 4.7% discount at the time – and 2 and a half years since TPG listed Ingham’s on the ASX as the PE firm continues to sell down its stake. The remainder of the holding will be in escrow for 2 months, but stocks often struggle with such a large natural seller on the register. Coupled with the sell down, Ingham’s have been forced to recall some of its gluten free schnitzel packages which were incorrectly filled with a different product which contains gluten. Some suspect timing no doubt, but unlikely to be a big impost on the company’s earnings this year.